PSG boss annoyed with Arsenal and Spurs target | The Transfer Tavern | News, breakdown and analysis on all things football! Arsenal and Tottenham Hotspur fans in the Transfer Tavern have had to be separated this evening, as the race for an influential Ligue 1 midfielder heats up. The Daily Express states Paris Saint-Germain boss Laurent Blanc is annoyed that midfielder Adrien Rabiot has demanded a January move. 20-year-old Rabiot enjoyed a stint in the first-team due to the injury absence of Marco Verratti but has demanded a loan exit in the New Year if he loses his spot in the side upon Verratti’s return. Both Arsenal and Tottenham are chasing Rabiot’s signature and PSG boss Blanc stated his frustration with the young player ahead of tonight’s Champions League clash with Shakhtar Donetsk. 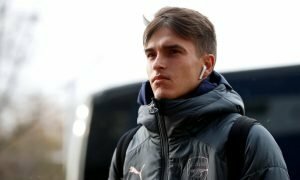 Spurs fans in the bar are desperate for the young talent to be signed, believing he’d be a welcome addition to their squad, but Arsenal supporters are growing increasingly worried at the player’s controversial behaviour. Which North London side should sign Rabiot? Let us know in the comments below!